Blinkit is a notification software that can be used to give regular widely available devices a Steem purpose. With this latest update it is now possible to set and save the Logitech model the user have,and the related device picture will be (pre)loaded in the interface. When selecting one of the Logitech models, the related settings for this model will be made visible or hidden depending, if the selected device supports the functions. RGB Colours or Monochrome device. Beside the device model selection it is now possible to trigger animation on the Logitech device when new Steem actions are detected by Blinkit. The action will trigger a related animation on the LCD screen. Animations can be edited or replaced by the user and are stored in images/logitech/*action they need to be saved as a monochrome bitmap file. Animation played on the LCD, when a NEW UPVOTE is received on the by the user saved account, for new Followers and Posts the displayed text will be "NEW FOLLOWER" , "NEW POST"
Animation played on the LCD, when the Steemmakers bot is upvoting. Animation played on the LCD, when the price alarm is triggered. Animation played on the LCD, when the Utopian bot is upvoting. When one of the supported devices is selected, "LCD" "LED" and "LED,LCD" will be available as a mode to select for the blink action. 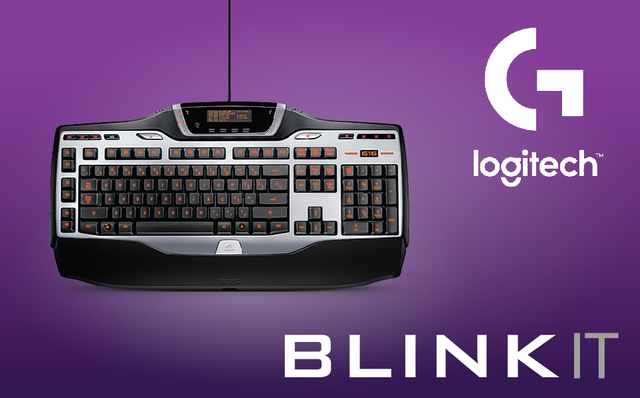 To use Blinkit and Logitech devices together, the user needs to have the by Logitech provided Logitech Gaming software installed. This could be installed in the default or a custom location, because of the posibility to edit the path to it from within the Blinkit interface. and in this release the paths are now made hidden on default and can be toggled visible and hidden when clicking on the DLL label. Blinking the LED lights of Logitech devices was previeusly added in v2.3 but there was still the LCD part of the Logitech gaming software we would want to integrate. @flash4yard developed the backend code, and writes about the development of the backend code in his latest post . How is it implemented into Blinkit ? Code that toggles the visibility of the DLL paths. 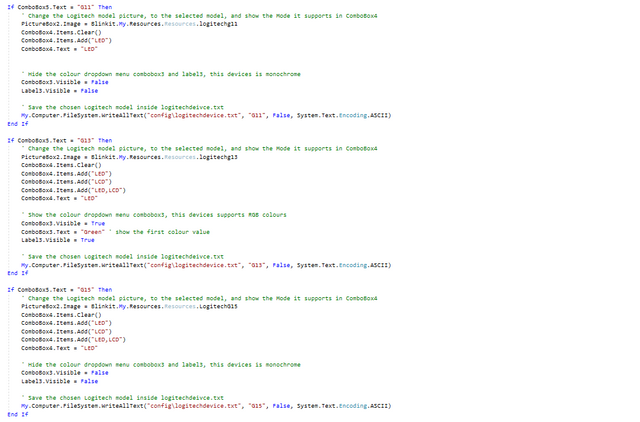 Part of the code that displays the model picture and shows the related and compatible features. Drowdown menu "Mode" can now beside the previously added LED Mode also show the LCD mode and LED,LCD mode. the related mode / features for the blink action get visible depending on the selected logitech device model, and it supported features. (LED, Monochrome, RGB, LCD). This is implemented to make sure to only present the features the users logitech device support. Created animations for each action: upvotes, followers, posts, utopian, steemmakers, price alarm. 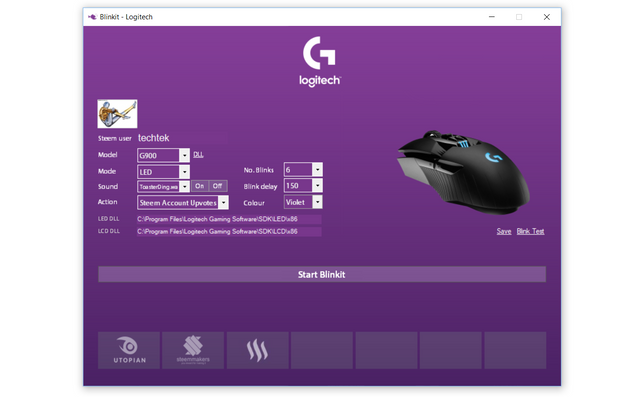 Modified and added Logitech product pictures to fit the position in the interface and to be in line with eachother. 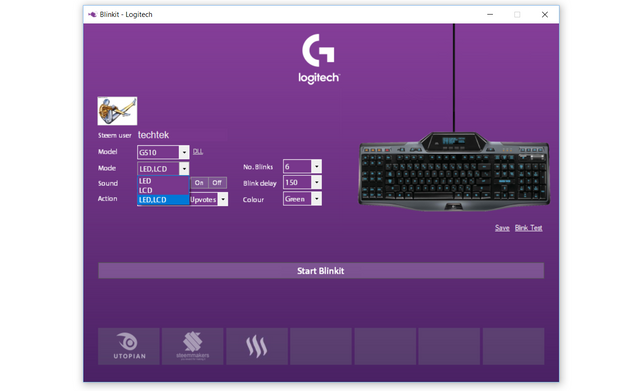 Updated upvoteslogitech.bat followerslogitech.bat, steemmakersvisualizer.bat, utopianvisualizer.bat and the steem price alarm, with the new mode ("LCD", "LED", or "LED,LCD") for Logitech LCD animations and / or LED light notifications. Part of the upvoteslogitech.bat that blinks the logitech device with the related settings. Do you want to write for Blinkit, or contribute in a other way? Feel free to get in contact in the Blinkit Discord server, don't hesitate and get in touch! or leave a comment. @techtek You have received a 100% upvote from @getmyroi because this post did not use any bidbots and you have not used bidbots in the last 30 days! Congratulations! Your post has been selected as a daily Steemit truffle! It is listed on rank 20 of all contributions awarded today. You can find the TOP DAILY TRUFFLE PICKS HERE. I upvoted your contribution because to my mind your post is at least 15 SBD worth and should receive 70 votes. It's now up to the lovely Steemit community to make this come true.